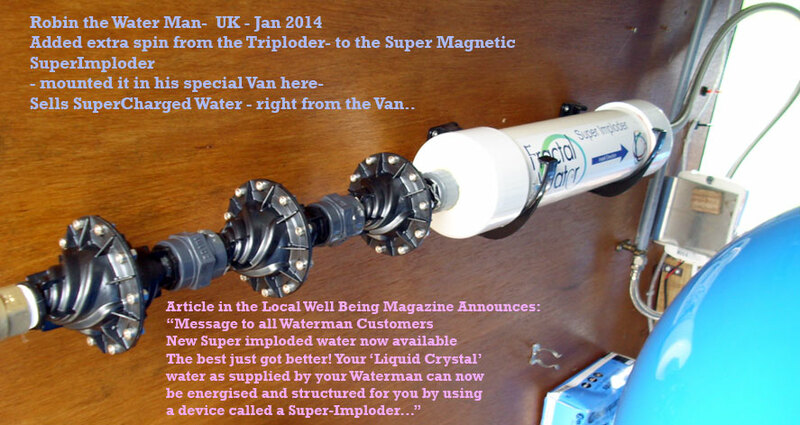 Robin The Water Man- Mounts Superimploder in Water Truck- UK Jan 2014 Message to all Waterman Customers New Super imploded water now available The best just got better! Your ‘Liquid Crystal’ water as supplied by your Waterman can now be energised and structured for you by using a device called a super-imploder. I’m fairly sure that many of you will not have heard of one of these, which is fine because I am very excited to tell you about it here. The science behind the development of this amazing piece of equipment is carefully explained and well documented by its designer and creator, the world renowned Scientist and inventor Dan Winter. Go to..... In brief though... using sacred geometrical vortex shapes based on the Golden mean spiral plus powerful magnets configured in a very specific alignment, Dan has designed and engineered a powerful water improver. As the water passes through the Super Imploder under pressure, it is spun centripetally by the inward vortexing motion of the spirals and then further structurally aligned by the powerful magnetic field. Implosion means the opposite of explosion. Centripetal movement is spiralling inwards towards centre as opposed to centrifugal which is spiralling outwards towards the periphery. It is this centripetal motion causes the water to be transformed into a more ordered state. Water in a stream that flows over rocks naturally implodes in on itself. This is why running water is fresher, cleaner and more energised than its still water counterpart. Essentially, this implosion apparatus is not just copying, but also enhancing the process of naturally running water and there is a significant and measurable difference with how the water behaves afterwards. Independent reports on using imploded water on seedlings and plants have demonstrated that it dramatically increases growth and germination rate. Percentage rates.... I personally have watered my Aspidistra with it and have noticed a marked increase in new foliage and the plant definitely seems a lot ‘happier’. These Super Imploders are now being used across the globe by farmers, Plant growers, Market Gardeners, health enthusiasts.... and many enthusiastic testimonials are available by going to Dan Winters website. To summarise; the water has simply been moved in a specific way (spiralled) and it has travelled through a powerful magnetic field of a very specific alignment. That is all! Nothing has been added to it, it is still H2O. Not all water is the same!! For more insights into the properties and nature of our liquid life support system (water) go to .....to watch an inspiring documentary on the subject. For over 12 years now your Waterman has sourced and supplied the best water possible for you. Now, I offer you the best local water and can improve it even further using the Super imploder by Dan Winter. For your free sample of freshly Imploded water call Robin on 01752 895381.